The Folland 'Gnat' was somewhat like the Northrop F-5 in terms of success, though on a much smaller scale. Like the F-5, it was only barely used by the Air Force for which it was designed, having better luck in foreign sales. For the Gnat, the major success was with the Indian Air Force. A light-weight fighter bomber was just what was needed for the air force of the world's largest democracy. The first few aircraft were delivered direct from the UK with those going into service in early 1958. But the IAF wanted to be able to construct them locally. The first plane built from kits flew on November 1959, and after a few other kit-built planes, construction shifted to HAL production lines with the first indigenous plane flying in May 1962. Over 185 Gnats were built until 1974. Many Gnats were operational during the 1965 war with Pakistan and acquitted themselves well during combat operations. 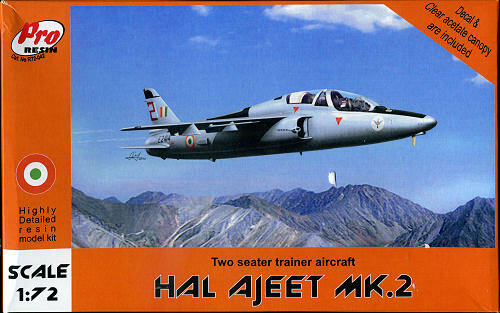 Modifications made to the Gnat resulted in the Ajeet, which had several improvements, including wet cells in the wing to help improve range, better avionics and an upgraded engine. The first Ajeet flew in 1975 with 80 examples being built until production ceased in 1982. It was only natural that a trainer version would have been developed from the Ajeet. After all, it was the two seat Gnat that was built in the greatest numbers in the UK. Two prototypes were built that were basically just lengthened Ajeets, retaining all four pylons and both 30mm cannon. Only two prototypes were built with the first crashing in 1982 and the second flying in 1983. Despite positive trials, the project was dropped. ProResin kits have always been superbly molded. the parts are free from most resin glitches like air pockets and slag, though I did find a couple of areas that had been slightly chipped during shipment. As superbly as ProResin packages their stuff to keep down damage, it is pretty much inevitable that some of the finer bits will break away from the pour stubs. This may be due to no protective barriers on the ends of these stubs to keep other bits from directly contacting the fragile parts. Something ProResin might want to look into adding to these bits. Anyway, the detailing is superb with crisply molded panel lines and there is even some fine interior sidewall detailing. There is some resin flash over things like wheel well openings, but is easily removed. The cockpit is not the usual tub, but a floor with rear bulkhead onto which the finely molded and rather unusual bang seats, control sticks and instrument panels are attached. All the wheel wells are separate and to my eyes, have the proper well detailing in there. Thanks to the solid nose, there is little room for weight, but none is indicated in the instructions. Not surprisingly, aside from the cockpit and fuselage halves, the majority of parts are exactly the same with the previous kits. One thing I should mention is that there is a long raised lip along the bottom of the fuselage halves that will need to be sanded down. This is undoubtedly from the pour stub attachment point. The canopy is vacuformed and two are supplied in case the second is needed. Instructions are well done, consisting of seven well drawn construction diagrams, a separate cockpit painting section and color chart providing Humbrol, Model Master and Revell paint references. Markings are given for what looks to be the second prototype. It is in what looks to be overall aluminum lacquer. The lone set of markings is for 2 squadron where it was undoubtedly used for a hack and for refresher training for desk jockeys. The decals themselves are just outstanding. Well printed with no apparent registration issues and in the proper colors by Begemot Decals in Russia. Instrument panels and the nose anti-glare panel are included on the sheet. So there you have it. A kit of the Ajeet that I did not know even existed until this one arrived. As these kits tend to sell out rather quickly, I'd highly recommend grabbing one while the grabbing is good. Check your local retailer for availability. My thanks to www.olimpmodels.com for the review kit. Ask your local store to order one for you.